According to the Arkansas State Red Wolves article funds raised through the Grand Slam banquet go into the baseball program to help with stadium and locker room improvements as well as new indoor and outdoor batting cages. Ticket options are available that includes an exclusive reception and personal photo with Al Hrabosky as well as an autographed baseball. Al Hrabosky, nicknamed “The Mad Hungarian” because of his antics on the mound, is a former MLB pitcher who played for the St. Louis Cardinals from 1970 to 1977, the Kansas City Royals from 1978 to 1979 and the Atlanta Braves from 1980 to 1982. Hrabosky was left-handed reliever who had his best season in 1975 when he lead the National League with 22 saves plus he registered a 13-3 record with a 1.66 ERA for 97.1 innings pitched. For the past 32 seasons Hrabosky has been calling games on Cardinals’ telecasts and for 20 campaigns has been a color commentator for Fox Sports News Midwest. 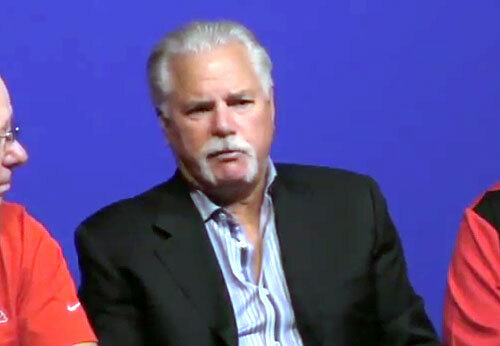 Hrabosky was inducted into the Missouri Sports Hall of Fame in February 2003. PFP Sports Talent Agency is a top booking agent for motivational sports speakers and sports personalities. If you would like to book MLB stars like Al Hrabosky for a speaking engagement, personal appearance or special event, you can request Al Hrabosky agent and speaker information from PFP Sports Talent Agency or call 800.966.1380.